For the most part, they succeeded. In many ways this is the most consistent of their projects so far. This is not to say that the project itself is perfect, because it is not. There are problems with the album, which is to be expected of a freshman debut -- but the overall experience is remarkably consistent and well done. I loved the production on the album, having been self-produced by Elliot and moving away from the samples used in D.R.U.G.S and BetterOffDEAD, opting instead to go with original beats throughout the album. While the beats don’t have the same depth as those in D.R.U.G.S and BOD, they flow well within the album, never getting in the way of the music itself. 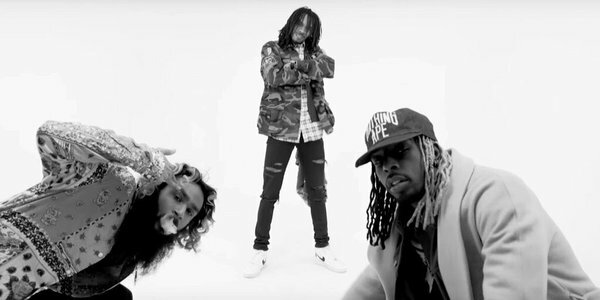 The actual raps themselves are standard Flatbush fare with Meechy Darko leading the other two with his dark and gritty voice, growling his way through some fantastic verses and dropping absurd lines like “I want that head like ISIS”. It’s not a self-serious album, which can be refreshing, and shouldn’t surprise any fans of the stoner rap trio. Juice and Erik did step up their verses to keep up with Meechy, which was much needed as it eliminated an obvious weak point of some of their earlier albums. The two still aren’t quite on the same level, but they perform admirably well alongside him, serving to only amplify the contrast in their voices. The weakness of this album comes with its consistency. D.R.U.G.S and BOD, had lower lows, but this album doesn’t come anywhere near their highs. There is no “Palm Trees” on 3001. There are some great songs, with “Ascension”, “Trade Off”, “New Phone, Who Dis?”, and most of “Your Favorite Rap Song” being fantastic. In fact, the entire run from “Ascension” through to the end of the album is fantastic. I only wish it wasn’t capped off by five and a half minutes of voice mails praising the band at the end of “Your Favorite Rap Song”. 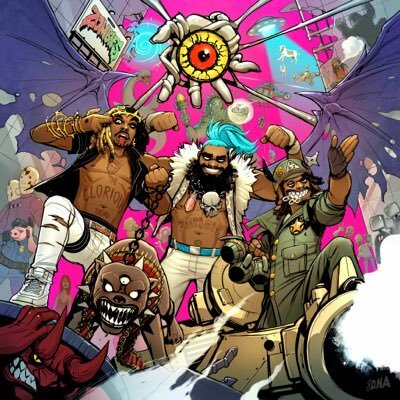 This self-congratulatory aural masturbation really colors the song negatively to me, as you come off of one of the strongest song in the album into a section that is almost longer than any other song on this album as fans congratulate the Flatbush Zombies and their stoner rhymes for changing their lives. It feels narcissistic and a little stupid to me, to be honest, and it really doesn’t fit with the tone of the album. It feels like an advertisement, or a preemptive pat on the back to the band. It’s a cool shoutout to fans, but it really has no place on this album. Despite the disappointing and anticlimactic finish, it still is a great album. It doesn’t try to be D.R.U.G.S or BOD. It tries to be something different. I can’t say yet if that is a good thing for the group but it does make me very excited to see what else they can produce in coming years.